From Laughing to Bucking to Speeding, we’ll keep you entertained in Las Vegas! 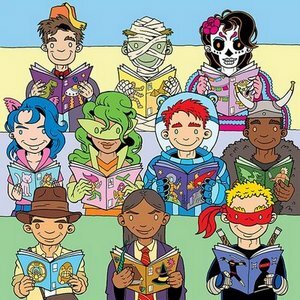 The Clark County Library is holding their 11th annual Vegas Valley Comic Book Festival on Saturday, November 3rd. The library is located at 1401 E. Flamingo Road (and Escondido St.), which is east of Maryland Parkway. This is a free event during the hours of 9:30 a.m. and 4:30 p.m. The event is inside and outside, featuring established and new artists for all things comic. There will be podcasts, live entertainment and artist meet-and-greets. They will also have a few food trucks, in case you get the urge to eat. In the past, they have offered a VIP ticket for $7.93 (includes fee) which included a goodie bag, posters and a badge; however, the VIP ticket is limited to the first 100 purchasers, so you might be out of luck unless you jump on it as soon as you read this article. If you are into bull riding, horses or just “wanna be a cowboy,” the next couple of weeks are for you! Get your boots and spurs on and dig into some of these made-to-order jean and hat activities. The PBR World Finals will be hosted by T-Mobile Arena each evening from Wednesday, November 7th through Sunday, November 11th. 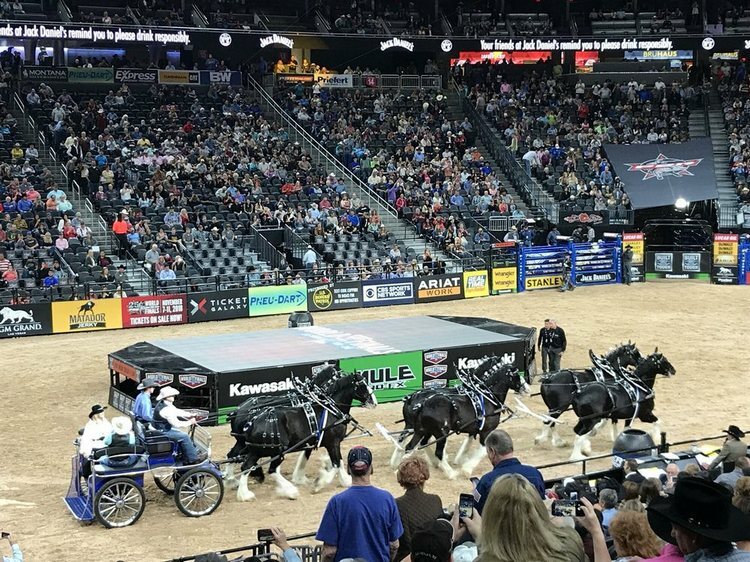 This is the richest bull riding event in the world! Tickets range from $45 up to $1,096 and can be purchased for a single day or a package for two or five days. They have premium seating available with a VIP Gold Elite Seat package for $5,000 covering 5 days or a VIP Silver Elite Seat for 1 day for $1,000. The premium seating packages include, amount other things, a pre-party reception, a behind-the-scenes tour, an autograph of your favorite rider, concert VIP sections and vouchers off of your PBR Rockbar tab, and PBR Merchandise. This is actually a week’s long event culminating with the PBR Finals Week Western Gift Expo held at Southpoint Hotel starting on Friday, November 2nd and throughout the next week. The gift show is free and open to the public. Southpoint is a definite go-to place for all things PBR! They are hosting Chris Shivers Miniature Bull Riding for children aged 8 through 14 in various divisions beginning on November 2nd. Their after party entertainment scheduled for the 2nd and 3rd in their Showroom at 10 p.m. includes Vanessa Legrand and the Spazmatics. And don’t miss the Bull Sale on Tuesday, November 6th from 3:00-5:00 p.m., along with barrel racing and meet and greets at the Expo on Saturday, November 10th. PBR Rockbar & Grill in the Planet Hollywood Miracle Miles Shops is the official after hours party place on the Strip from 11 p.m. until 2 a.m. every night. They have really good food, although not cheap, and long and tall drinks. How about an 88 oz. Fender Guitar? Or, a 100 oz. Super Yard? ($39 each, in case you were wondering). They have happy hour with small plates from 2 p.m. until 6 p.m., Monday through Thursday. Keep in mind that it will be super packed during these 2 weeks of the Finals activities, but it is really a nice place to relax, chill out and shoot — or ride — the bull. 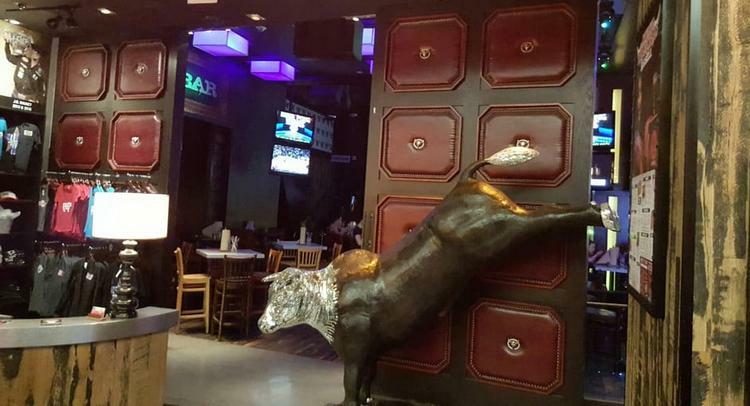 You can have a free bull ride with the purchase of a drink or entrée. By the way, you might still be able to score a Yelp coupon for a free drink with drink purchase. Check it out! And don’t forget to visit Toshiba Plaza in The Neighborhood on Wednesday, November 7th at 4 p.m. for the Monster Energy Party Zone and the accompanying Unleash The Beast Bull Rider Arrival Show. The top 35 bull riders are present for autographs and photos before entering the T-Mobile Arena. These events are free to the public and last for hours. The Neighborhood consists of T-Mobile Arena, Toshiba Plaza and The Park. There are numerous other activities in town during this time period revolving around the PBR, such as the RRF Clay Shooting Tournament at the Clark County Shooting Complex, the PBR Charity Golf Classic at Bali Hai Golf Club and the Bucking Horse Finals at the Southpoint, all on Thursday, November 8th. Motor Trends’ International Auto Show featuring 2019 model year vehicles is the lead into the NASCAR Sprint Cup Champion’s Week in Las Vegas. The Auto Show will be held at the Las Vegas Convention Center on Paradise the weekend of November 23rd, ending on Sunday, November 25th. The hours are 9 a.m. until 6 p.m. each day with tickets $10 each for those aged 13 and over, $9 (62 and over and military) or discounted by $1 for each of those prices if ordered in advance. NASCAR Week begins on Monday, November 26th through Friday, November 30th, featuring the top 12 drivers of the series. This is the 10th year the postseason awards will be held in Las Vegas. Along with awards night on Thursday, November 29th at the Wynn Hotel, the week will be filled with driver appearances and autograph sessions at NASCAR fan headquarters, podcasts from various hotels, the victory lap with burnouts on the Strip and partying Downtown. For a complete schedule visit the NASCAR website. Diamond Jack loves eating, and when he finds a special restaurant or dish, he enjoys sharing that discovery. Pop Up Pizza at the Plaza Hotel downtown is from Michael Vakneen, who will be competing in the U.S. Caputo Cup national pizza competition, entering the new Old School Cheese pizza category. Old School Cheese pizza is freshly-shredded mozzarella and provolone cheeses placed directly on pizza dough and covered with homemade plum tomato sauce to create a crispier, more traditional pizza. It is then topped with fresh Aiello mozzarella, baked and finished with Sicilian oregano, fresh cut Genovese basil and grated Italian parmesan cheese. Pop Up Pizza ingredients include California tomatoes, pepperoni from the famous Ezzo Sausage Company of Cleveland, Ohio, and mozzarella directly from Brooklyn, New York. All pizza dough cold rises for three days before baking. His Detroit Special has a special rise that takes 13 hours, during which the dough proofs in a specially-made metal pizza pan from the Motor City. The pizza has a cheese crust that tastes like a parmesan cheese cracker, while the dough remains soft and pillow-like. Pop Up Pizza is just off the casino floor. For more information check out the webpage of Pop Up Pizza at the Plaza Hotel-Casino. How hungry are you? If the answer is really, really hungry, there is a 16-pound Tomahawk steak from brothers David and Michael Morton waiting for you at MB Steak, the luxury steakhouse at Hard Rock Hotel. The Tomahawk dinner is priced at $1,200 and requires an advance order of 72 hours. Executive Chef Patrick Munster prepares the dry-aged USDA Prime steak with MB’s signature spice blend before slow roasting the meat overnight at a low temperature. The Tomahawk, cooked to medium rare, is carved tableside with a Wüsthof knife. The dinner is ideal for groups of 10 to 12 people. It is accompanied by MB Steak’s signature steak sauce and served with six shareable side dishes including lobster mac & cheese with cavatappi pasta; creamed corn with king crab and roasted poblano; maitake mushrooms with aged goat cheese; and creamed spinach with a poached egg and truffle gouda. Cal 702-483-4888 or visit www.mbsteaklv.com. 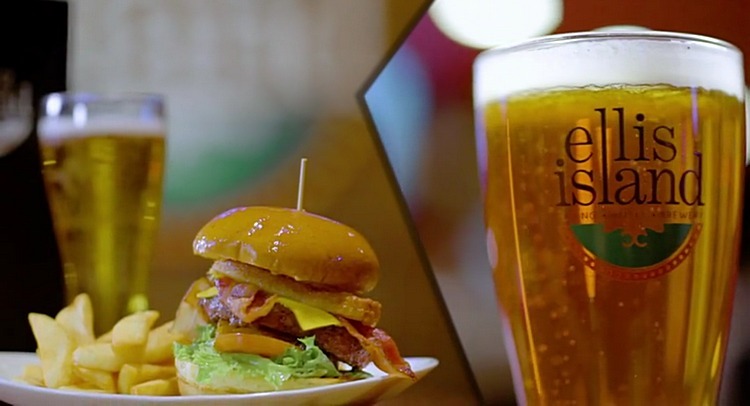 Ellis Island Hotel, Casino and Brewery has two new accomplished brewers Michael Key, as director of brewery operations, and Eddie Leal, as head brewer. The two new brew masters are updating the brew program, debuting at least one new brew a month, and incorporating more diverse, unique beers into the brewery’s beer tap rotations. Rounding out the offerings at Block 16 Urban Food Hall, Ghost Donkey, New York City’s famed mezcal and tequila bar, has opened at The Cosmopolitan. It is located on the second level of the Boulevard Tower with an intimate speakeasy style setting. 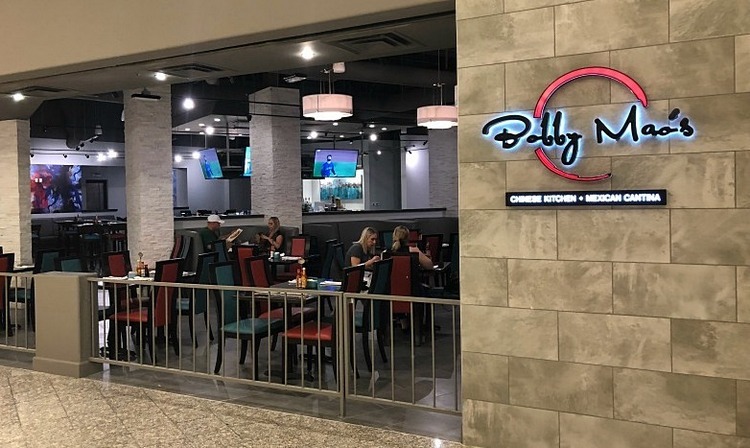 The Galleria at Sunset mall’s newest dining experience is Bobby Mao’s Chinese Kitchen + Mexican Cantina taking over the space formerly occupied by Chevys Fresh Mex at the main entrance next to Red Robin. This is the first location in Nevada for Bobby Mao’s, which offers a selection of Chinese and Mexican fare. Restaurateurs Bobby and wife Tina come from Palm Desert, Calif., where they operate Bobby Mao’s Chinese Kitchen. This spot has a main dining room bar and lounge space with TVs, couches, booths and a misted outdoor dog-friendly patio. In addition, every hour is Happy Hour with an expansive selection of specialty cocktails, including $10 Top Shelf Margaritas, $6 house wines as well as beer. Hours are daily starting at 11 a.m. Bobby Mao’s at Galleria website. While Off The Strip is a restaurant at The Linq, it also now a brand new website promoting Las Vegas area businesses, dining places and activities. It is a robust portal catering to locals covering the following categories: Events; Restaurants; Shopping; Services; Activities; and Vegas Stories written by local residents. 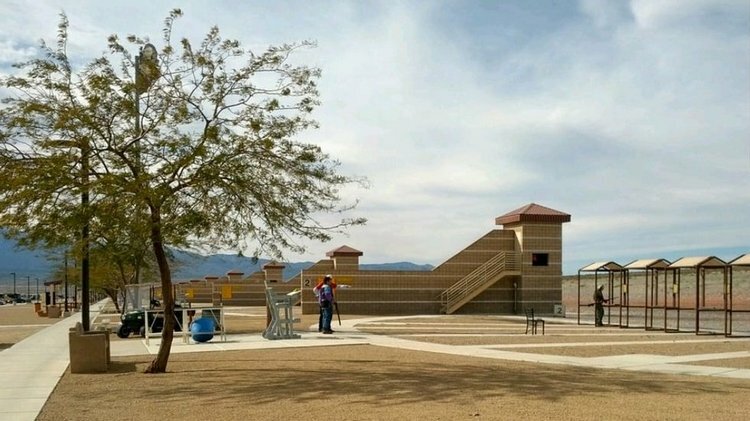 Think of it as Las Vegas beyond the tourist corridor, and you can sign up free. www.offthestrip.com/.